A friend asked me if I’d be up for guest blogging for her blog related to running and runners. Needing to build a portfolio of “my work” and have some samples of my writing, I gladly agreed. I returned to running after a long furlough. I was motivated by having turned fifty and needed to drop some serious weight. Running was the elixir to getting me back into peak shape. Quickly, I was up to 3 miles per outing and doing 4 to 5 miles before long. I started entering local races; the camaraderie was exhilarating – I was hooked! I needed more challenges to keep me interested and on a regular training routine. After my first half marathon, I was ready to take on “The Marathon.” Or at least that’s what I thought. I was too late to enter the 2003 NYC Marathon, but Philadelphia was doable – so I registered and began my intensive training. There were good days and bad, and before long, marathon weekend had arrived. Being in Philly was electric and exciting. 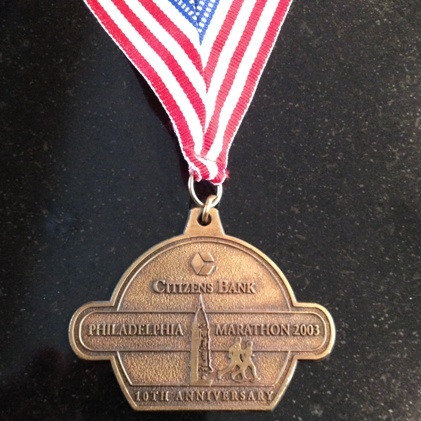 I was so damn excited – I was joining the ranks of marathoners – I was now a legitimate runner! When the race started, Ben Franklin Parkway was packed with runners galloping gleefully along in a rainbow of colored running apparel. My energy was high – This was the experience I had so anticipated; it was everything I had hoped for. As I traversed the downtown streets and navigated the different neighborhoods, I settled into a comfortable rhythm. All was fine until around mile fourteen. As I headed north along the Schuylkill River, my legs turned into oak logs. What was happening? Was this the dreaded “Wall?” This wasn’t suppose to happen until later in the marathon. How was I going to finish with another twelve miles to go?? This is when you learn what you are made of – and given my legs felt like mush, I had some serious doubts. But, I kept going, as best I could, taking walk breaks, intermittently. At times, it seemed the worst was over – I was able to maintain a reasonable pace – but not for long. When I made the turn near Manayunk to head for the Finish, I knew I could do it, but I still had five more miles left. Laboring, I persevered. Every time I saw the word, Marathon, on the light pole banners, I cursed! I never wanted to hear that word ever again. At a mile out, I knew I’d make it and felt a surge. My gait quickened and the throbbing in my legs seemed to disappear. As I crossed the finish line, fetching my finisher’s medal, I raised my arms victoriously – triumphant, having completed my first marathon, but deflated – it was not the performance I had envisioned.